Provide comfort for the family of Bobby Davis with a meaningful gesture of sympathy. 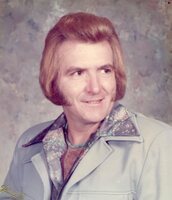 Bobby Ray Davis, 77, of Fort Smith passed away on February 4, 2019 in a local nursing home. He was born on April 6, 1941 to George and Ocy (Boyd) Davis. He was a retired shipping supervisor at Baldor, a past member of the Elks Club and of the Chrisitan faith. Graveside service is 10 am Thursday, Feb 7, 2019 at Dripping Springs Cemetery under the direction of Ocker-Putman Funeral Home of Fort Smith. Visitation is 5-7 pm Wednesday at the funeral home. He is survived by two daughters, Tammy Slavik of Fort Worth, TX and Dolly Smalling and her husband Rusty of Lavaca, Arkansas, two sisters, Dorothy Henry of Huntington, Arkansas and Carol Haralson of Fort Smith, AR 5 grandchildren, Curtis , Spencer and Bobby Slavik, John Mark Smalling and Ericka Waterbury and 8 great grandchildren. To plant a memorial tree in honor of Bobby Ray Davis, please visit our Heartfelt Sympathies Store. The family will visit with friends from 5-7pm on Wednesday at the funeral home. We encourage you to share your most beloved memories of Bobby here, so that the family and other loved ones can always see it. You can upload cherished photographs, or share your favorite stories, and can even comment on those shared by others. Dolly, Tammy, Aunt Carol and Aunt Dorthy; My prayers and sympathy to you all, It is so hard to say good-bye to those we love, I will keep close all the good memories of the times we were together at Mama Davis's, celebrating family and holidays. Dear Family and Friends of Bobby Ray Davis, I read of your loss and want to express my sympathy to all of you. May your many memories bring you comfort during this difficult time and your prayers bring you the peace of God that goes beyond all human thought to guard your hearts and give you hope, Philippians 4:6, 7 and Acts 24:15.